We enjoyed a version of this at the truffle lunch, three ultra thin slices of smoked blue fin tuna belly lay across the plate onto which a rectangle of egg custard is placed. 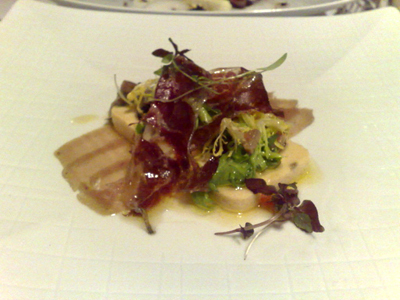 Jamon is draped over the simple leaf salad. 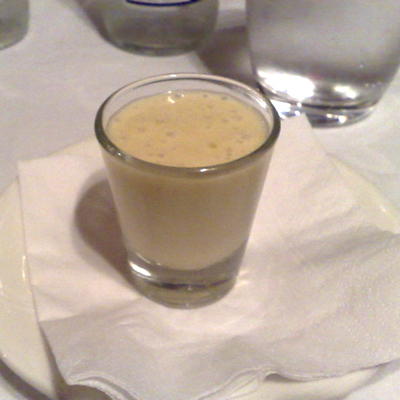 The egg custard is at the perfect junction of solid and liquid and works to extend and surround the various tastes and textures of the dish. 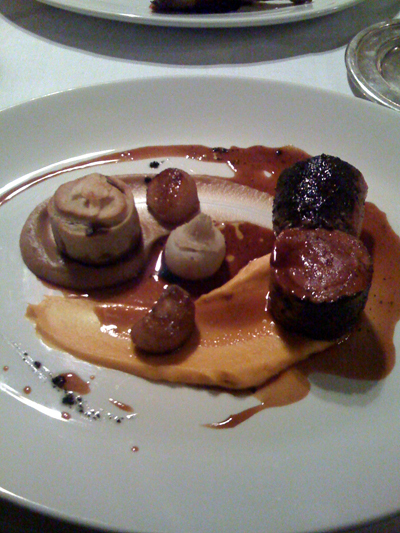 Well worth a second photo to focus on those beautiful slices of wagyu. A masterful combination. 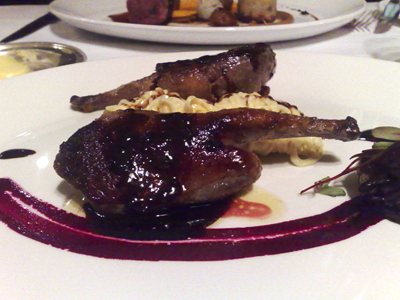 I couldn't go past the sauce perigold and when it came with pigeon and truffle linguini, my decision was set. 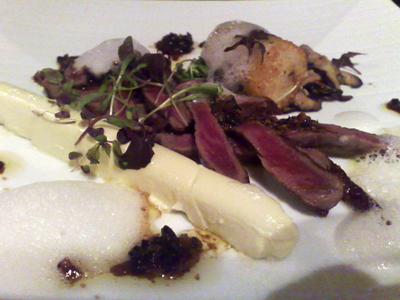 The pigeon was served pink, tender and moist and each boned half was filled with a truffle and foie gras farce. A tight roll of truffle linguini sat between the two halves. 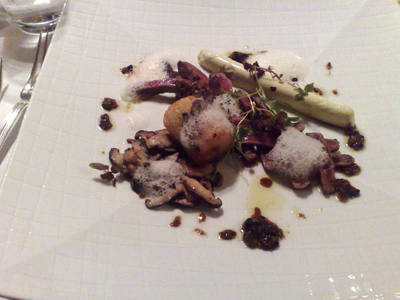 Paalo was immediately drawn to the notion of "lambs fry pie". 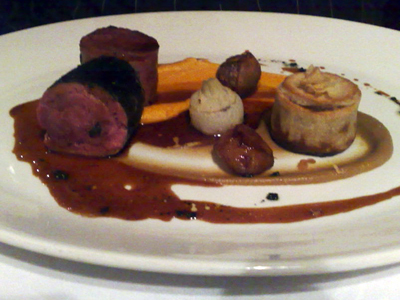 Beautifully pink lamb loin, velvety purées of roasted onion and carrot, drizzled with a sticky rosemary jus. 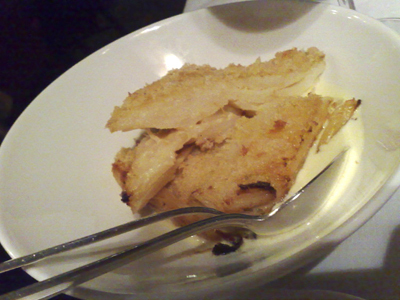 Gratin Dauphinois Potatoes with an extra treat, they are truffled. 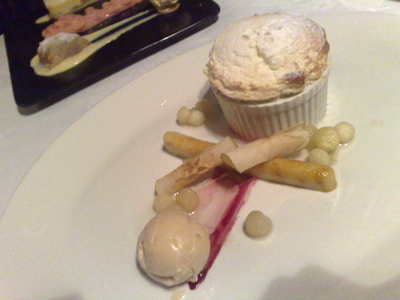 I was seeking something light so went for the soufflé. The calvados brulée takes the form of a long tube with cylinders of dried apple placed across it. The apple compote is pleasantly tart a welcome contrast to the honey and cinnamon icecream. 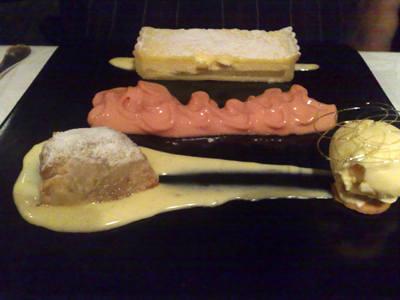 At the top of the plate is a generous slice of the pear and mascarpone tart, in front of it is the rhubarb foam. 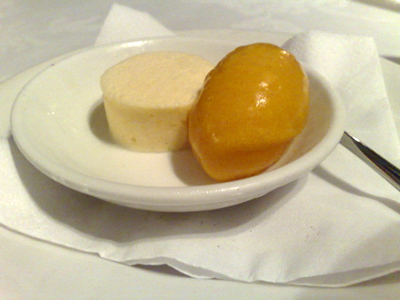 To the left is a small quince filled filo parcel and to the right, topped with a delicate toffee swirl is the ginger ice-cream. 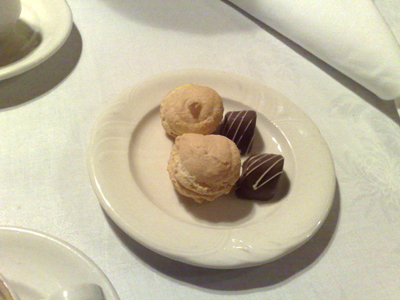 To finish, petit fours with coffee.